“It was pouring rain at 2:00 O’clock in the morning, in Oshawa Ontario, when I sat on the mat, disappointed, frustrated, and a little helpless. It was one of those nights when I tried to bring to life the stories I had read about how the Prophet (PBUH), his companions and the righteous in the early days of Islam made their sweetest experiences of connecting with Allah. I had enjoyed my first rak’ah and felt a pleasant surge of spirituality permeating my limbs only to see it fade as I proceeded to the second. And there I was in search of that Paradise-like sweetness of the night prayer but only to experience ephemeral glimpses of it and end up wondering what went wrong that I couldn’t stay there for a while. Let me have a guess, you probably saw yourself in the lines above. If so, you’re not alone. I personally have received an infinite number of questions about how to develop a steady sense of mindfulness, presence and peace in the prayer. I usually gave the traditional answers about observing the exact physical manner of the Prayer, to throw the world behind, to feel one’s standing before Allah, etc. Don’t get me wrong, these answers are great but they’ve become trite, redundant, and unfortunately meaningless due to overuse and abuse. Many well-intending Imams, scholars and students of knowledge have used such advice in a fast-food, mass-production, pain-killer, quick-fix manner, just to get another question answered and unfortunately without putting so much heart and soul in the process. This soul-less approach to answering sincere questions about khushu’ in the Prayer has lead to a sense of helplessness, and ultimately, indifference towards such a supposedly lively and refreshing part of our relationship with Allah. Years later as I had been feeling my relationship with Allah was getting a bit dry, I thought to myself it seems if I don’t so something about this, it may just get worse. Subhanallah, soon I came across a small book by Ibm al-Qayyim distilled from one of his big books. Spot on, I knew Allah was answering my du’aa. The book had insightful points. At moment it just seemed to express what’s in my heart and I felt that at some level I had an intuitive knowledge about these points. The book wasn’t really written by Ibn al-Qayyim specifically on the subject; he wrote that material while elaborating on a certain point in his original book. This is why I felt sometimes the book started to take me on a wonderful journey only to drop me off halfway through with an incomplete notion. It felt awkward at times; such a great book but it doesn’t offer a full-experience of what it means to stand in front of Allah in Prayer, heart and soul. This disappointment grew into an intention to find the missing pieces of the puzzle and offer myself and others a full-range insight into the deeper experience of the Prayer. I set out on my journey researching books that could possibly offer something relevant. It wasn’t an easy journey as most of the books on the Prayer focus on the operational aspect (technical fiqh) of the Prayer: conditions, pillars, nullifiers, etc. a few months later, I had in hand a good deal of material that offered an exceptional view into the inner experience of the Prayer. I was experimenting on myself. I employed everything I’d learned and experimented in my daily prayers, sometimes for days and weeks, to find out for myself what worked and what didn’t work out, and how long it took to start seeing satisfactory results. By the way, certain aspects of the inner experience of the Prayer reveal themselves only after you’ve proved you wanted them badly; good news…never give up; it all pays off in the end. Alhamdulillah I’ve documented this experience in my forthcoming book on the inner experience of the Prayer. It’s been an outstanding journey of growth and one of the rare moments were my mind was clearly aware of how Allah guides us to what is best. This is a sneak preview into the book which I pray will help the reader transform their experience with the Prayer. I’m still looking into possible titles for the book and am welcoming any suggestions you may have, so feel free to share them below. And if you have what you believe is an interesting story with the Prayer, I’m keen to hear from you, so please message me on this blog. 12 Responses on My Story with the Prayer. By: Moutasem al-Hameedy"
Beautiful post, puts a lot of things into perspective. I am looking forward to this book. Do you plan to include emotionality in the prayer? One of the ‘fast-food’ answers that we often here is love, hope and fear to be felt in the prayer. I think a lot more can be said about the topic. People recognize what these emotions mean in regards to natural relationships, but not with the divine relationship. There is a difference in raw-experience in terms of the love one feels when speaking with a friend, parent, spouse versus the subjective experience of love felt in the salah. Also, not much is said about fostering and developing these emotions. Jzk Zohair. I didn’t speak directly about emotionality in the book. It’s my view that directly addressing emotions is problematic, but the book, at least as I feel, is full of emotion and reason the same time. I focus on hidden meanings and the inner experience in general. I chose a suggestive approach as my research made it so clear that each one has their own way to khushu’. So general principles are helpful, anecdotes are inspiring, but directions can produce adverse effect. Anyway, soon inshaAllah the book will be published in Arabic first. The English version (which is not a translation per se) will follow a few weeks later. As to feeling love towards Allah, it’s intuitive as far as I could see, but often we have cultural baggage that makes us feel at a distance from Allah. I stressed the idea of opening up to Allah at a very friendly basis, yet full of awe, in order to let that intuitive love to Allah emerge naturally. This was my personal experience and that of some friend who’ve read the draft and tried it out. Thank you for sharing this touching personal story of you and the prayer. For years I have struggled and am still struggling with having khushoo in prayer. I have tried to look for answers and mostly found the ‘fast food’ answers that though while correct, did not really address the root of my problem. Alhamdulillah Allah swt guided me to watch your video, “The Sweetness of Salah”. Masha Allah you were able to approach the topic from a fresh and different angle, and alhamdulillah, for the first time in my life I actually understood the meaning of khushoo. 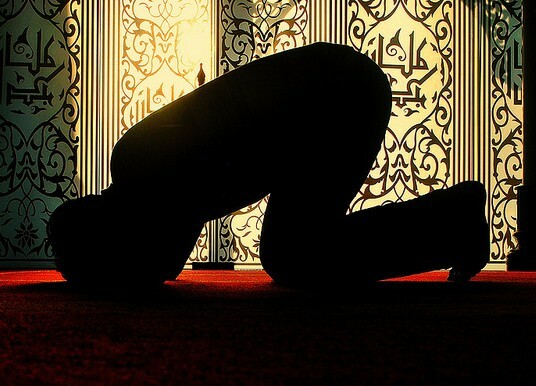 I understand now that to have khushoo, my heart needs to feel a connection with Allah in the salah. I need to make the prayer a personal experience between me and Allah. SubhanAllah this is was like a major discovery for me. Although I still have a long way to go, alhamdulillah my prayer did improve and I was able to taste a little of the sweetness of salah. So I really want to thank you for this. May Allah swt reward you with the best of rewards. Ameen. So it goes without saying that I am really excited and looking forward to reading the book insha Allah. May Allah swt bless this effort and allow it to benefit as many people as possible. Ameen. Jazakum Allahu khayr. Barakallahu feek. Hope you are doing well. I am awaiting for the book. Hopefully the book might help many of us to Improve our Khushu in Salah, In Sha Allah..May Allah bless you with in this world and hereafter. When you speak about the emotional aspect, the recitation of quran with real emotions actually makes us experience a lot of khushoo in prayer. Thats my experience. The emotions which come as a result of knowing the meaning of what we recite and the contemplation of it gives the recitation a life. It sometimes feels like your emptying all your feelings and emotions to allah Subhanwata’la in the salah from the depths of your heart but in a very submissive and composed manner. I don’t know how to put it in words. But i just hope you understood . Wa alaykum asalam wr wb sister Zohra, absolutely this is lovely description of the state of khushu’ and connection to Allah. When one has no words to describe it, you know they’ve experienced it. Jzakalillahu khayran for sharing this description. I wish to know more about your expience with khushu’ if you don’t mind, it sounds interesting; I think there’s something there I can learn from. Jazakallahu khairan sheikh. One more aspect im trying to put in words. It is also releasing all the pent up wide ranging emotions and energy in a positive way but it isn’t just self servicing at the same time. Like when we try to connect to the Quran on a deeper level we realise that are emotions are being translated, it happens when we don’t read the Quran just literally but try and connect to it with our life experiences and self knowledge (in the context of how it is interpreted by the scholars). This registers in our subconcious mind because our intention is to get closer to Allah swt. And when we pray we feel the recitation come alive laced with real feeling and emotions. And at the same time we feel small and submissive and helpless but its a good feeling . The feeling of feeling weak and small in the presence of Allah is a very fullfilling feeling by its self. Its a warm nurturing feeling at the same time. Wa alaykum as-salam wr wb, jzk sister Amatullah. Sure, I’ll be writing a series of articles on this blog to highlight some of the main points in the book, inshaAllah. Assalamoualaikum Shaikh! I am not an Arab though I have learnt some Arabic. It is by understanding the words one is reciting that one can develop khushoo. I am from Mauritius and can observe the lack of concentration in general in non Arabs during salaat in the mosque. It is really a great pity! One can also observe that when muslims make dua in their own language outside salaat they are more concentrated than during salaat which shows the importance of learning Arabic. It is moreover bidaa and sins from passions that keep us away from Allah. Commit less sins and the prayer is beautified and when one commits sins, a feeling of guilt and weakness is felt before Allah during salaat. I also believe that with maturity and age, the love of Allah increases, obedience increases, disobedience decreases and with time khushoo increases. I learnt my connection with Allah Subhaanahu Taala when I listened your cries during recitation of Surah Al Imran and wondered why did you cry at those particular Aayaats (Qul in kuntum tuhibboon Allaha fattabiooni yuhbibkumullah) when I learnt the meanings of these aayaats my heart and soul was shaken. I thought it was so easy to get Allah’s love, I just have to follow Allah’s commands. and those commands are so easy to follow like five times prayers and ikhlaaqe hasanah. As the time was passing my prayers were becoming so easy but than I also realised that Shaitaan has penetrated deep in my soul. My thoughts were going again and again towards those sins which I enjoyed in the past and despite tears in my eyes due to fear and love of Allah those thoughts are not diminishing. I am still in that phase where I need some one guidance and advice to defeat shaitaan. I feel I am blessed by Allah because He gives my strength to stand infront of Him five times a day. Moulana, I believe my reason to understand Allah’s love is you. I prayed for you and cried that may Allah give you the highest ranks in Jannah. I also prayed that Allah gives you whatever you asked during recitation of Surah Al Imran. I desperately need your prayers to Allah Taala as you were the reason of this change in my life. I want to go to that path too where I can improve my khushoo in each nimaaz after every previous nimaaz.